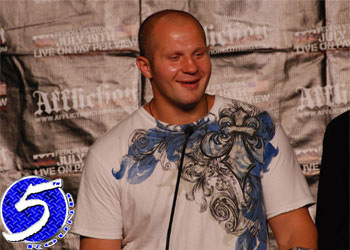 Earlier this month, HDNet play-by-play announcer Michael Schiavello ripped Fedor Emelianenko (Pictured) and his M-1 Global management for their “diva”-like behavior following the Russian’s New Year’s Eve knockout victory over Satoshi Ishii. Schiavello claimed “The Last Emperor” made his fellow fighters wait an extra 90 minutes to head back to the hotel so he and his entourage could have an entire 70-seater bus all to themselves, while everyone else crammed into the other shuttle. Although Emelianenko never addressed the alleged controversy directly, Matt Hume, who was present during the entire delay with protégé Bibiano Fernandez, recently cleared the air regarding the bus ride heard ’round the MMA world. “There were a lot of languages going on that night: Russian to Japanese, Portuguese, English. So, I think something got lost in translation there,” Hume explained (Transcribed by LowKick). “But what really happened was that Fedor was in doing interviews and everyone was waiting on the two buses, and Fedor was to get on one of those buses and go back. “So, both buses were waiting for him. Everybody else had finished their press, but of course, Fedor is very popular in Japan, he had not finished his press yet and they were still keeping him there. So, everybody was staying there waiting. “So, Fedor asked if they could let the people go who wanted to get back to their hotel. Very graciously, Fedor said, ‘Hey, why don’t you let those guys go home.’ So, they did ask us to move onto one bus, which there was plenty of room on the one bus for everybody, and then one bus would stay and take Fedor back later. And there you have it. No harm, no foul on Fedor.